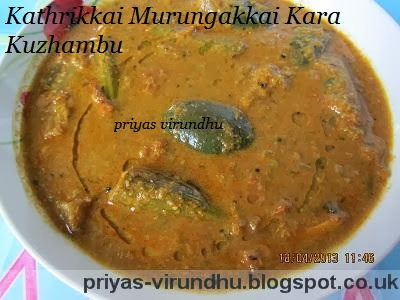 Today, Priya’s Virundhu special is authentic and traditional TamilNadu dish -Karamani Kara kuzhambu. 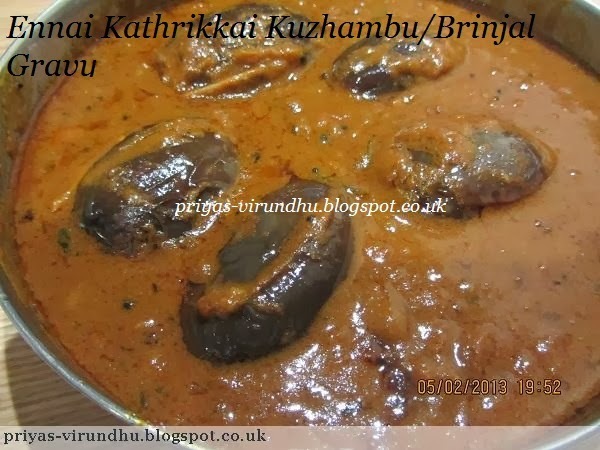 “Kara Kuzhambu” means “spicy gravy”, you can adjust the spice level according to your taste. But the measurements I have given will surely suite for everybody. 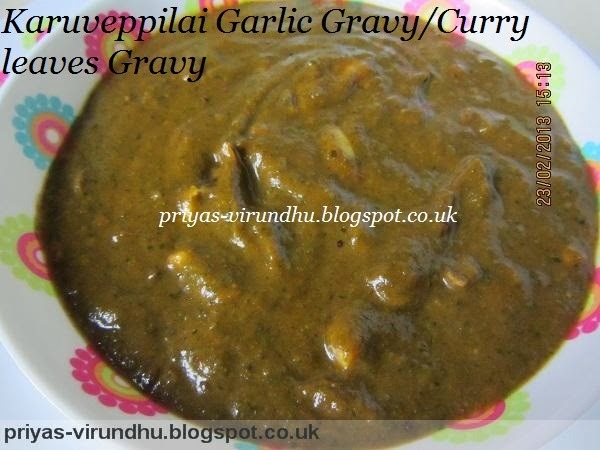 This gravy is my daughter’s favourite, she loves to add 1 tsp of gingelly oil to the hot steaming rice along with this gravy and enjoys it with rice vathal or appalam. Try it out friends you will all surely love it. 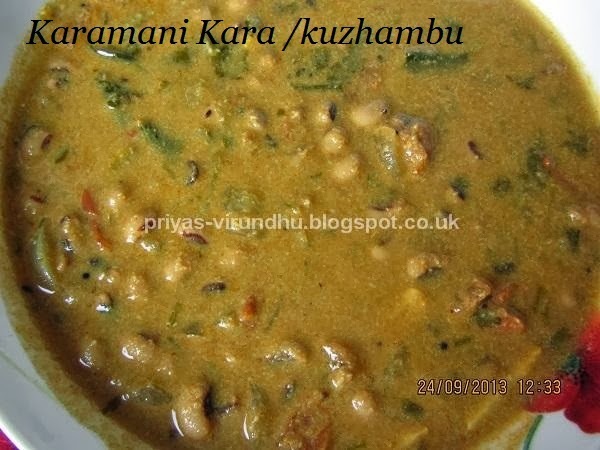 One delicious, healthy and finger licking karamani kara kuzhumbu right from my kitchen to you all. Check out other delicious South Indian -TamilNadu special Kuzhambu varieties here. 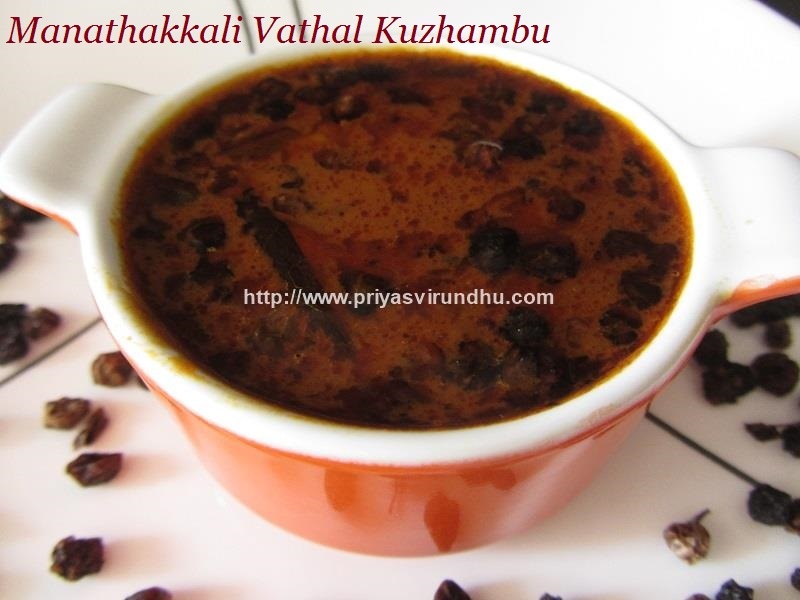 Vatha kuzhambu is a very traditional and authentic dish made in Tamil Nadu. Here I have used Sundakkai vathal or Turkey berry (dried)/Bhankatiya [Hindi] to make this healthy and mind blowing gravy. 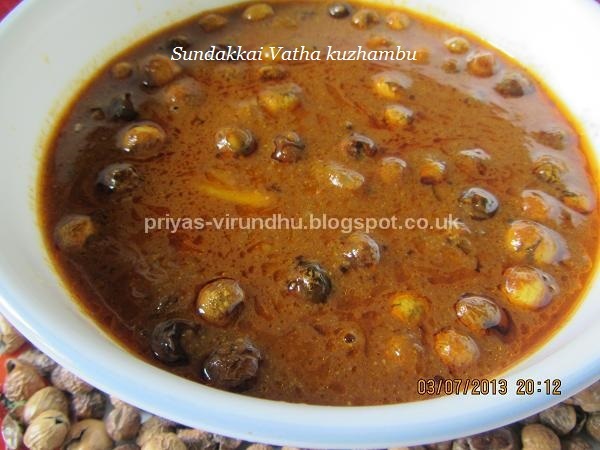 I learnt this vatha kuzhambu from my mom after I got married and ever since have been making the same without any changes. 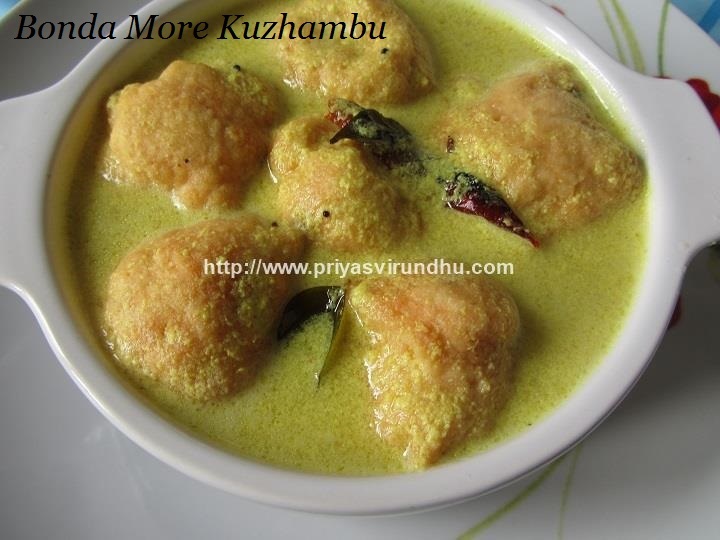 Check out other delicious South Indian -TamilNadu special Kuzhambu varieties here. 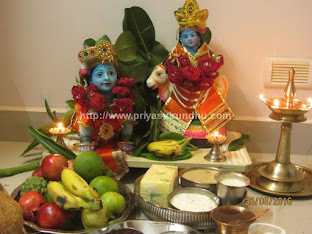 Before going in to making of this vatha kuzhambu I surely want to share the importance and the benefits of sundakkai. Sundakkai is called as Turkey berry; it has extraordinary medicinal values which can cure many diseases. Turkey berry is a green colored fruit with bitter taste, it can be used fresh or in dried form as vathal. Turkey berries (sundakkai) have the ability to kill the germs, helps in controlling diabetes, gastric problems and when consumed on daily basis helps in strengthening the bones and nerves. I have been cooking all vegetarian for the past two weeks which is very unusual of me. 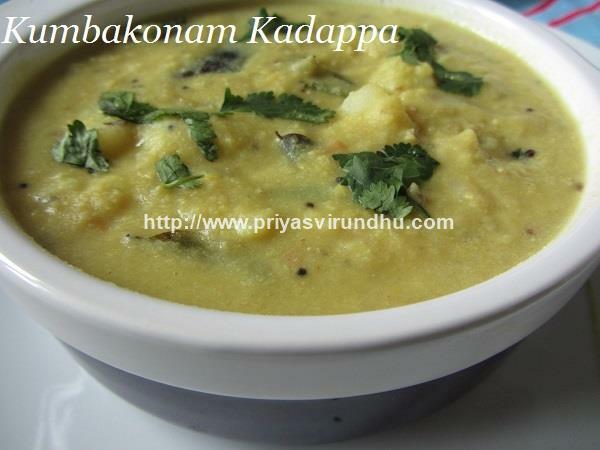 I was so worn out and tired because of a very hectic week end but did not want to make sambar. 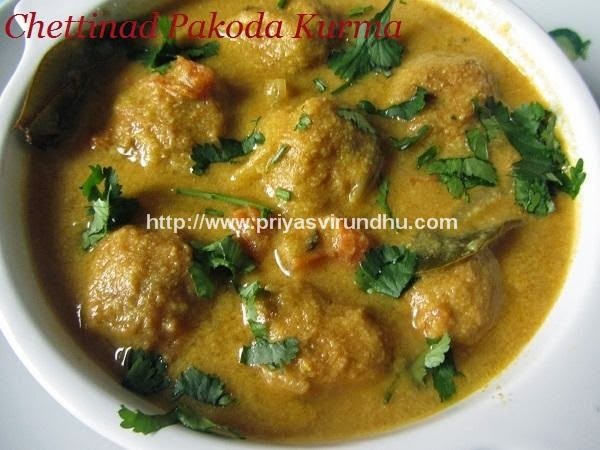 So I decided to make paruppu urudai kuzhambu because it’s been so many days after I made it. 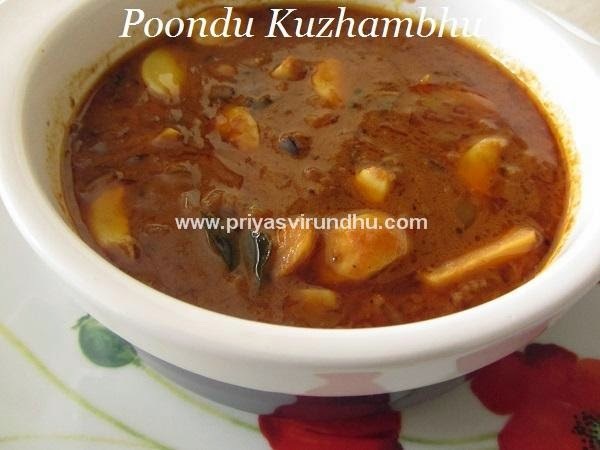 Check out other delicious South Indian -TamilNadu special Kuzhambu varieties here. 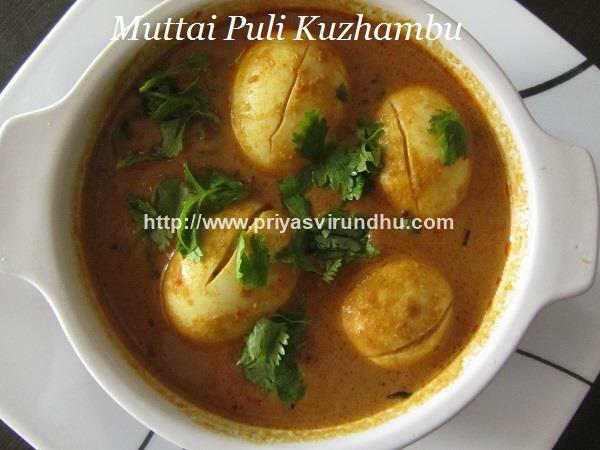 Milagu kuzhambu/Pepper Kuzhambu is a traditional South Indian kuzhambu made by blending black pepper corns with other spices and ingredients. I have been making lot of dishes with pepper now, the reason is that though spring started officially in March, it is still cold and flowers are blooming only now(May). UK has faced a very bad winter after 50 years, and it is now raining and hail falling down, the weather is really pathetic. The perfect lunch for us I decided was milagu kuzhambu/Pepper kuzhambu and potato roast, an apt lunch for cold and rainy days. 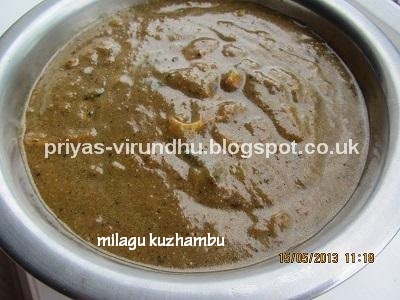 Milagu kuzhambu has lots of medicinal values, it helps us when we have cold and cough. The pepper helps in getting rid of the phlegm and congestion. It also helps in digestion and gastric problems. 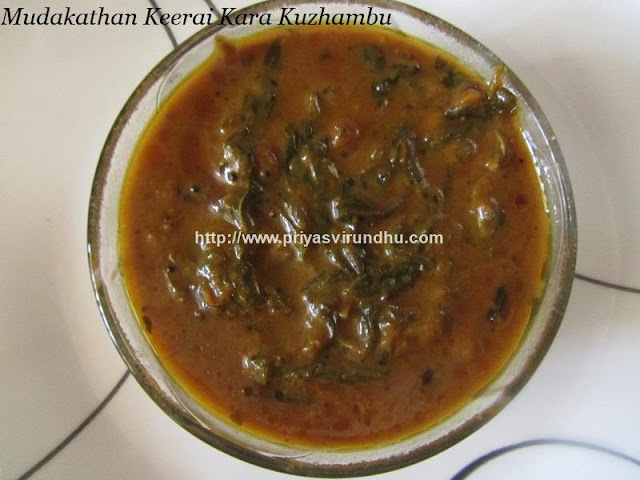 Since we add lots of curry leaves this kuzhambu is also rich in iron. 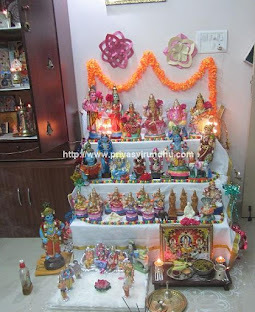 This is my mom’s special milagu kuzhambu. You can use sunflower oil as well, but gingerly oil is excellent for this kind of kuzhambu's gives rich aroma and very good taste. Check out other delicious South Indian -TamilNadu special Kuzhambu varieties here. 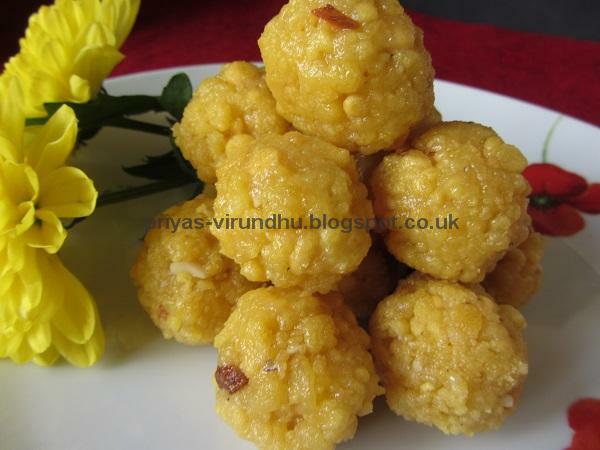 My mom makes different types mango kuzhambu's and this is one among them. 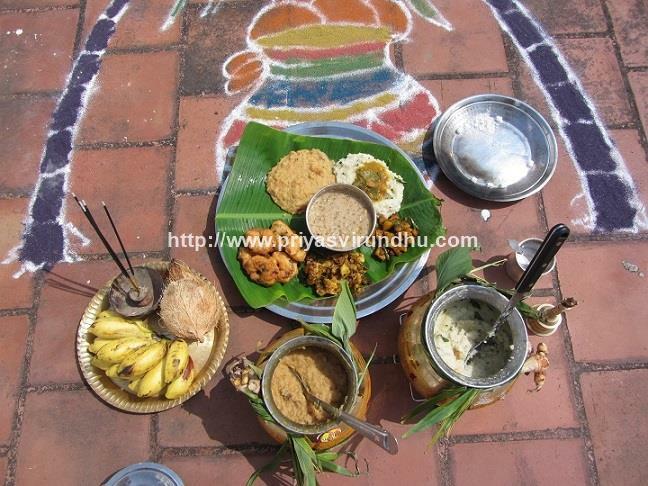 This is a typical South Indian kuzhambu, especially made during the mango season. Though this recipe might look spicy, the sour mango will balance it and taste awesome. Check out other delicious South Indian -TamilNadu special Kuzhambu varieties here. Tomato gravy is one of the special South Indian gravies especially made in Tamil Nadu. It is totally packed with Vitamin C and perfect for a light meal for any day. Sometimes I enter at the last minute in to the kitchen, without any plans of what to cook. 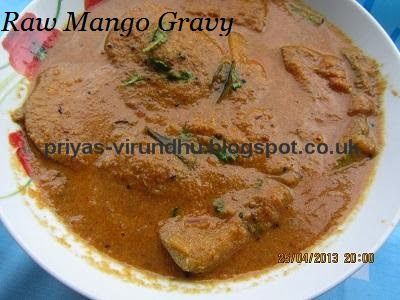 At those times, this gravy comes in very handy, because it can be made in a jiffy. Check out other delicious South Indian -TamilNadu special Kuzhambu varieties here. 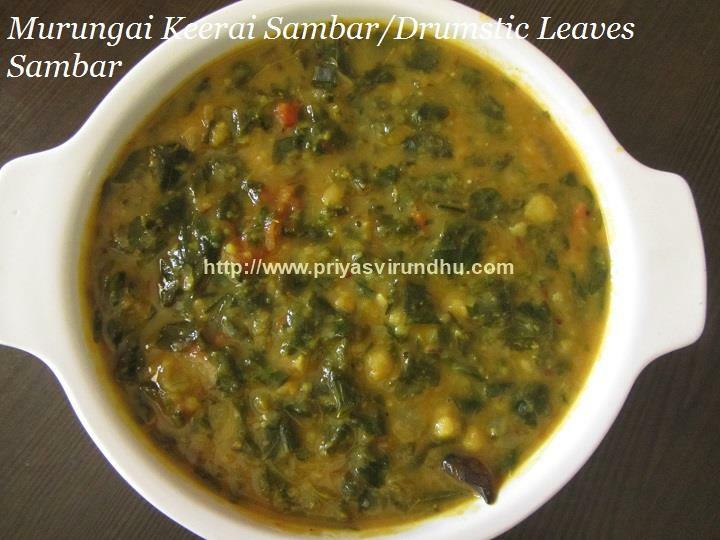 Karuvepilai is a very important ingredient in the South Indian cooking. It has many medicinal properties. But we usually remove the leaf and do not eat it. 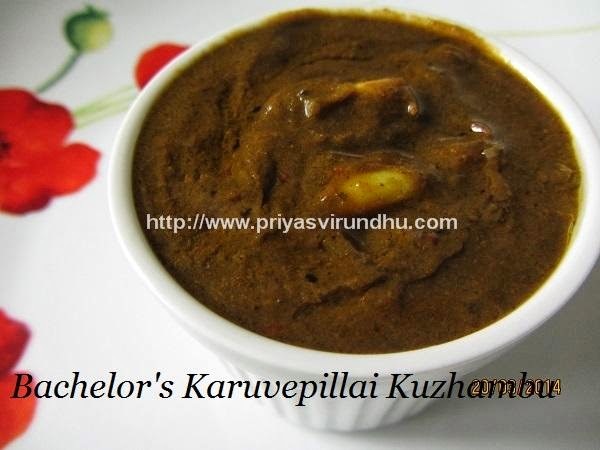 This karuvepilai kuzambu is one excellent way to consume karuvepilai. 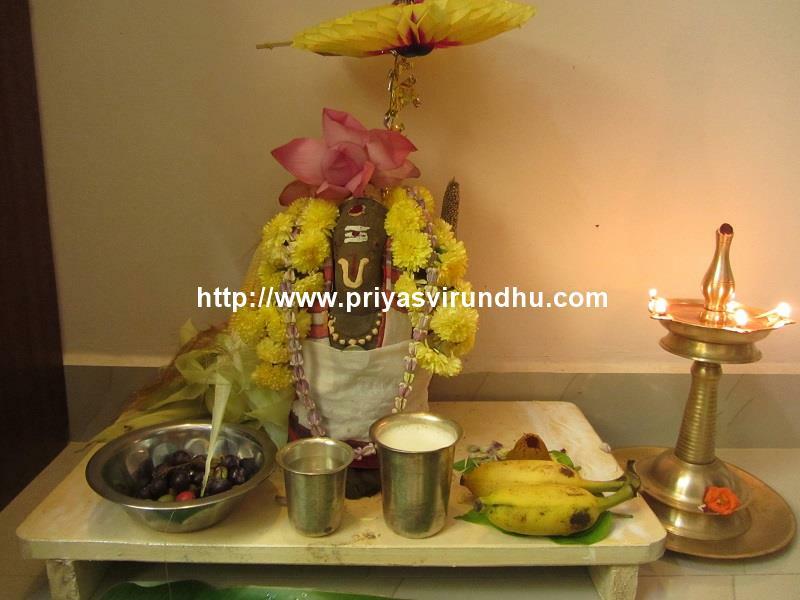 Curry leaves improves eyesight, a good remedy for indigestion. It helps in hair growth and prevents pre mature graying of hair. The benefits of curry leaves are numerous, and this is one easy to get our kids to eat curry leaves. Check it out and you will surely love it. 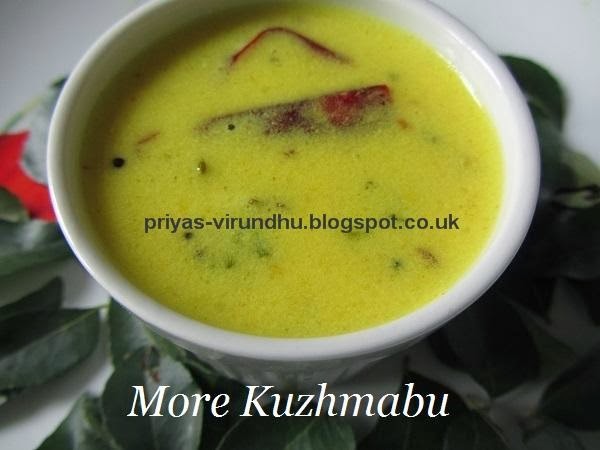 Check out other delicious South Indian -TamilNadu special Kuzhambu varieties here.